Edgar Allan Poe is best known for his poems and short fiction. Moreover, he was the father of the modern mystery. Additionally, Poe has had a worldwide influence on literature. Poe was born in Boston January 19, 1809 and died October 7, 1849 in Baltimore. Poe's parents, David Poe Jr. and Elizabeth Arnold Hopkins died before he was 3 years old. 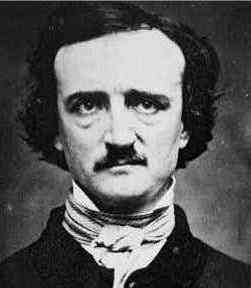 He was taken into the home of John Allan, and baptized Edgar Allan Poe. Form 1815 to 1820 he studied in England. Six year later, he entered the University of Virginia, where he studied for a year. While in the University, he ran up large gambling debts. To punish Pow, Allan prevented his return to the university and broke off Poe's engagement to Sarah Elmira Royster. Next, Poe enlisted in the army. By this time, he had already written and printed his first book, Tamerlane and Other Poems. After 6 months Poe was dismissed from West Point for disobedience of orders. Yet, in 1831, his fellow cadets, contributed the funds for the publication of Poems by Edgar A. Poe ... Second Edition. Poe's first love was poetry, but he was unable to make a living at it at first. After the army, Poe moved in Baltimore with his aunt Maria Clemm and her daughter, Virginia. While there, he turned to fiction as a way to make a living. In 1832 the Philadelphia Saturday Courier published five of his stories - all comic or satiric. In 1835, Poe, his aunt, and Virginia moved to Richmond. There, he became editor of the Southern Literary Messenger and married Virginia, who was 13 years old. His marriage forced him to find a way to earn money. When the editor of the Messenger offered employment, Poe accepted. At the Messenger, Poe was an editor and a contributor. In early 1836, Poe was credited with about 85 reviews, six poems, four essays, and three stories. He also wrote numerous editorials, and commentaries. Without a doubt, his contributions increased the magazine's circulation. Unfortunately, they offended its owner. The January 1837 issue of the Messenger announced Poe's withdrawal as editor. Poe attempted to establish a reputation in literary journalism in New York City (1837), then in Philadelphia (1838-44), and again in New York (1844-49). In February 1847, Poe's young wife died of consumption. Virginia's death in January 1847 was a heavy blow to Poe. After Virginia's death, Poe's life was falling apart. He suffered through a suicide attempt, several failed romances, and a long battle with alcoholism and depression. He was found unconscious on a Baltimore street. Poe died at the age of 40 in October 1849. In a brief obituary the Baltimore Clipper reported that Poe had died of "congestion of the brain." Take this kiss upon the brow! And, in parting from you now, Thus much let me avow - You are not wrong who deem, That my days have been a dream; Yet if hope has flown away In a night, or in a day, In a vision, or in none, Is it therefore the less gone? All that we see or seem Is but a dream within a dream. Story of a man who encounters the Angel of the Odd, a spirit who causes strange accidents as his job. Set in Cornwall during the 1800's, tells the story of the love between a young servant girl and shipwrecked emigrant and the problems their love causes for themselves and others. Details a crossing of the Atlantic Ocean in a hot-air balloon. A first-person narrative detailing the making of a murderer through life experiences, including his hanging of a cat, which later returns to haunt him. Details ways to make money without actually working. Montressor, an Italian nobleman, tells the story of his revenge on Fortunado, whom he believes has wronged him. One of Poe's few comical stories. Details Roderick Usher's decent into madness after burying his sister, Madeline, thinking she was dead. Tells the tale of the tragedy-laden reign of Antiochus Epiphanies, including his accession and his pollution of the Holy of the Holies. The story of a hunt for treasure that took place years earlier, told by a physician. The story of a man who watches as a fay, or fairy, travels from the light into the gloom, each trip making the creature more dark in mood. A man attempts to discover the truth behind humanity's existence. A murder mystery featuring the detective, C. Auguste Dupin. The story of a meeting between old friends during a journey across the Atlantic and a mysterious box that is carried by one. The torture of a man by the Spanish Inquisition, using a pendulum that swings ever closer and brings the man into a hallucinatory state. The poetry of Edgar Allen Poe. Famous poem of the raven, the narrator, and the darkness between the two. The tale of Sinbad and his battle with the evil Jaffar.